Today I’m unpacking more boxes of studio stuff. I’ve set a goal for myself: Five boxes a day, more if I can fit them in. My third box held my ink stamping pads and most of my spools of thread. 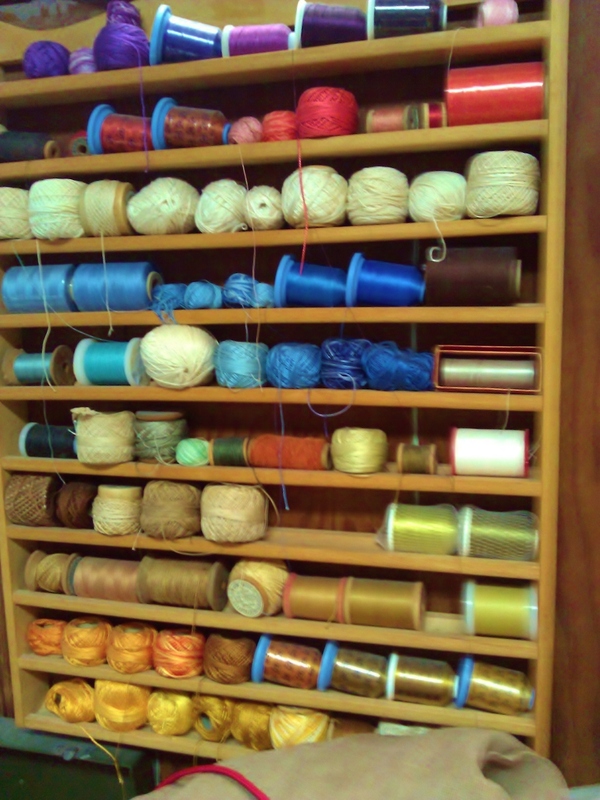 If you ever visited my studio, you know my thread collection was extensive. Be aware that thread has a shelf life. If you’re a seasoned sewer, you already know this. But when I first started sewing, I didn’t. I would go to an antique store and buy old sewing baskets full of thread, giant spools of thread from manufacturing companies (sturdy thread from shoe-making companies, etc. ), large spools of cotton threads, vintage spools of thread. I would start a project, thread my sewing machine, and start to quilt. And the thread would break. I’d re-thread the machine. The thread would break again. And again, and again. Then I realized the thread was too old, or sun-damaged, to use. This can occasionally happen with new thread, too. I took my machine in to Russ Moline at The Moses House in Keene. He was baffled, too, until he finally tested my brand new giant spool of quilting thread. It was a faulty batch, and broke easily. A sad, but fortunately inexpensive “repair” of the sewing machine! Cotton threads are especially prone to this. But sometimes silk thread can deteriorate, too. On the other hand, sometimes thread that LOOKS worn out or faded will still be strong enough to sew with. If you don’t like the fading, simply wind off enough thread till you get to the layer that was not exposed to heat and light. And of course, just because that old thread isn’t functional anymore, doesn’t mean you have to throw it away. Fill a mason jar, a thread rack, or a pretty bowl with your thready treasures, and put them on display. As I go through my stash, the rejects are tossed into a new lamp I just bought, with a clear base that can be filled with….spools of thread! My most recent article for The Crafts Report is 26 tips on how to make your craft show experience better. I was going to say, “more better”, but that would be redundant, wouldn’t it? And don’t ask me what the title means, I didn’t pick it. I meant to post this yesterday, but needed to calm down first. I’m frustrated beyond belief. You can skip to the end if you don’t want the details. I am over 21, I am a U.S. citizen, I have a residence, I pay taxes, I am registered to vote. I educated myself about the local issues. I have a California driver’s licence, and a Sonoma County Library card. But I was not allowed to participate in yesterday’s election. Backstory: We moved to Santa Rosa at the end of September (from New Hampshire) in a whirlwind of a move that took less than a month on our end, and left us with no time to even look for a new home on this end. By a miracle, we found a little place to rent our first day here. We moved in a week later, on September 22. I showed up on October 9 at the DMV. (It’s overwhelming and confusing, but basically a good system. I’m impressed!) Halfway through the process, I realized we had misplaced our NH car title. I did get my driver’s license and applied online for a replacement title to be sent to me from NH. It was not explained to me what would happen if I didn’t get that replacement on time. It took over two weeks. As soon as I had the new title in hand, I made another appointment to get the title in place for Oct. 28–the day before I had knee surgery. I got my title–but had to pay hundreds of dollars in penalty fees because the process had taken longer than the 10 days allowed. (10 days to register my car, when I didn’t even have a place to live until Sept. 22? ? Really??) That’s when I was told I could have STARTED the process on 10/9, and avoided the late fees. After following the recommendations of the local paper, The Press Democrat, for the past month, I made a list of all the issues, candidates and propositions and looked online to find out where to vote. I looked up my district and where I was supposed to vote. On a whim, I decided to look up my voter registration status online. Guess what? I wasn’t on the list. Oh, I’m technically ‘registered’. But I’d missed the cut-off date of Oct. 20. By six days. I would not be allowed to vote. I have voted in almost every every single election since I was eligible to vote–41 years now. I even volunteered at the polls the last few years. It’s exciting to be part of that process, and I loved it. We even had same-day voter registration–you could register at the polls and vote 10 minutes later. I remember a young woman who was voting for the first time six years ago. She was determined to vote for the president. I sent her to the registration desk. Twenty minutes later, she was back, and I handed her her very first ballot. The look on her face…. Uplifting. Not the case in California in 2014. Of course, it’s way, way too late to vote as an absentee ballot in NH. Not that they would have allowed me to. After all, I’m technically registered to vote in California, and was a legal resident as soon as I had my CA driver’s license. And I was no longer a resident in New Hampshire the minute we sold our house and had no ‘home address’ there. So I’m a stranded voter with no place to vote. And I’m appalled. A 15-day cut-off before the election?? There’s a “dead period” where I don’t exist as a voter in NH nor CA. I understand the California law has been changed (although I’m bemused New Hampshire, of all states, has proven to be more progressive than California….) I’ve been assured I can vote in the next election. Wow….thank you, California. I’m so grateful. But this was still an important election. Heck, every election is important. And I’m mad as hell I didn’t get to participate. Author Luann UdellPosted on November 5, 2014 November 5, 2014 Categories votingTags voter registration, voting rights, why can't I vote today?5 Comments on I CAN’T VOTE TODAY? !